Dylan—who was recently awarded the Nobel Prize in Literature—once admitted to Rolling Stone magazine that he stunned himself when he wrote the first two lines of ‘Like a Rolling Stone’ and rhymed “kiddin’ you” with “didn’t you”. “It just about knocked me out,” he said. Historically, many classic pop songs from the rock era have tended to feature ‘perfect’ rhymes where a one-syllable word is rhymed with another one-syllable word (such as ‘kiss’ and ‘miss’), or where two words have the same spelling in the last syllable (such as ‘love and ‘above’). These days, it’s best to steer clear of perfect rhymes, if you can, because rhymes that are too exact can often limit the expression of true emotion. You can create a much greater impact by rhyming words that don’t have the same combination of letters but sound similar (such as ‘clown’ and ‘around’, or ‘made’ and ‘late’). This is because sound-alike words tend to engage listeners more than words with the same spelling, as in the case of Dylan’s “kiddin’ you” and “didn’t you”. Using ‘false’ rhymes that create word pictures – or which convey what you want to say more accurately – can often be much more effective than pure rhymes. It’s not enough to simply go through the alphabet looking for words that rhyme, irrespective of whether or not the chosen word helps to underpin the meaning of your song and drive the story forward. This approach usually results in clichéd rhymes that we’ve all heard many times before. You can surprise the listener by having the rhyme fall on the second or third syllable of a multi-syllable word instead of at the end (for example, put the rhyme on the syllable that is stressed most strongly in normal speech, such as ‘unachievable’ and ‘believable’). You can also rhyme a multi-syllable word with a word that only has one syllable (such as ‘sublime’ and ‘time’). This device can make a lyric much more interesting. 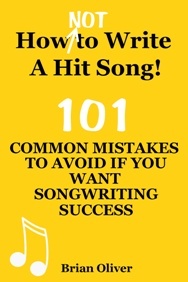 So don’t weaken a potentially good song by going for the easiest and most obvious rhyme. These days, lyricists have to be much more adventurous. Challenge yourself and make your rhymes less predictable. Read a FREE sample of the book HERE (USA), HERE (UK), HERE (Australia) and HERE (Canada). “SURPRISING RHYMING” – The Alternative Rhyming Dictionary for Songwriters and Poets – is available from Amazon as a US paperback, a UK paperback, and also across Europe. Read more about the book HERE (USA) and HERE (UK).